South Korea grabbed three gold medals at the 18th Asian Games in Indonesia on Tuesday. 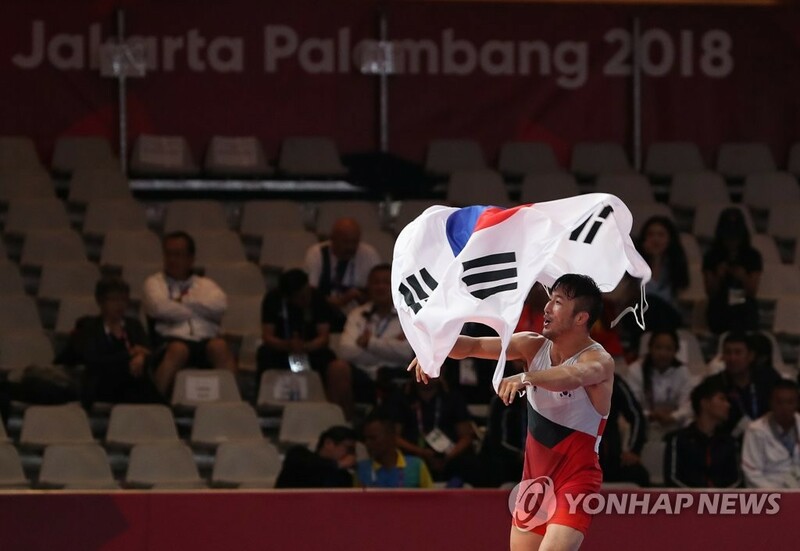 In wrestling, Korean Greco-Roman wrestler Ryu Han-su defeated Almat Kebispayev of Kazakhstan 5-4 in the men's 67 kilogram Greco-Roman final in Jakarta, defending his Asiad title in the category. In taekwondo, Lee Da-bin also successfully defended her title in the Asian Games, beating Deniz Cansel of Kazakhstan 27-21 in the final of the women's over 67 kilogram event. Lee Ah-reum took silver in the women's 57 kilogram class after losing to China's Luo Zongshi. In fencing, Kang Young-mi won the women's individual epee title by defeating Sun Yiwen of China 11-7. As of Tuesday, South Korea has won a total of eight gold, 12 silver and 14 bronze medals to rank third in the medal standings, behind China and Japan.